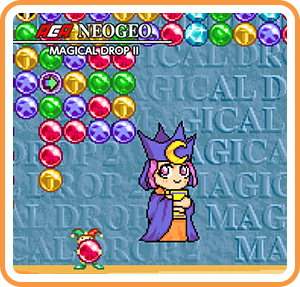 Magical Drop is played in a style and gameplay similar to Compile's (now Sega's) Puyo Puyo and Taito's Puzzle Bobble franchises; a "stack" of random colored bubbles descend from the top, and a player is defeated when a bubble hits the bottom. Bubbles can be picked up and dropped by the player's "clown" at the bottom, and are destroyed when three or more of the same color are put together on a single column. "Chains" are formed either when a single drop caused a chain reaction, or when more than one group of bubbles is destroyed in quick succession. The game is normally played with two players (one may be a computer opponent), and chains cause the opponent's stack to descend faster. There are 24 characters, all but the Black Pierrot being named after a tarot card (although the Strength card has been represented by two characters throughout the series). Different characters have different attack patterns. The columns of the opponent's stack will descend at different rates relative to each other depending on the character chosen. This causes a disjunction of colors that may make it more difficult for the other player to clear their stack. For example, with the character Devil, all the columns will descend at the same rate, whereas with Sun, the middle columns will descend faster than the others. Where can I buy ACA NEOGEO MAGICAL DROP II physical/digital?